It is extremely important to know the difference between poisonous and non-poisonous snakes, as poisonous snakes can be deadly. The most effective control measure is to remove as much snake harborage as possible. Areas such as wood piles, and other debris attract snakes and should be removed or, in the case of wood piles, elevated off the ground. Close mowing of grass and other surrounding vegetation also reduces snake harborage. 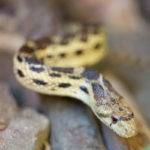 Captured snakes can be removed from the premises and released elsewhere where they will not pose a problem for someone else. Rat-sized glue boards can be used to capture snakes. Snakes captured on glue boards can be freed by pouring ordinary vegetable cooking oil over the snake. The oil will break down the glue, and the snake can be removed using a stick or pole. Glue board snake traps should be used only in protected areas and extra caution should be taken to prevent children, pets, or non-target wildlife from accidentally encountering.